This week’s instalment of the #SBIDinspire interior design series features the original CAD visualisation of an interior design scheme designed by YA Interiors to aid their clients visual understanding of the Art Deco inspired restaurant project which is currently in development. The Sheridan suite is a venue that hosts a diverse range of corporate and private events for up to 1800 people with 2323 square meters of space. Based on the ambience of Harrods food hall, the flexible venue was designed to capture the quirky, contemporary and traditional aesthetics which is a regional favourite for Indian Brides and Grooms located in East Manchester. 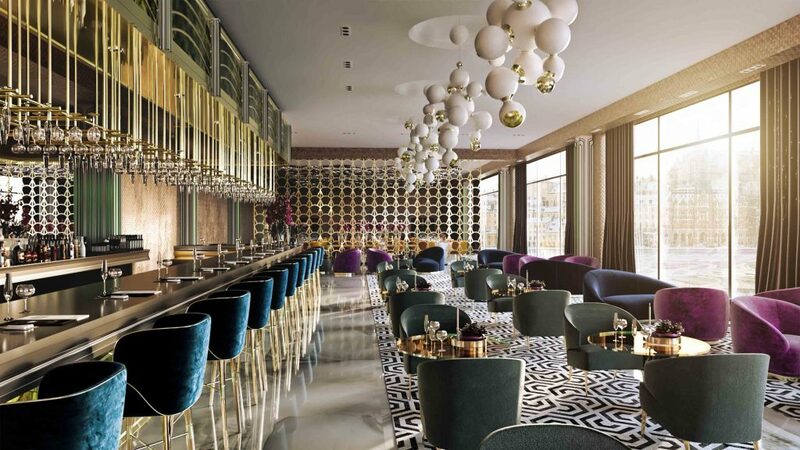 Entering through the brass curved reception area, the calm atmosphere of the cocktail lounge is the focal point with its illuminated columns. 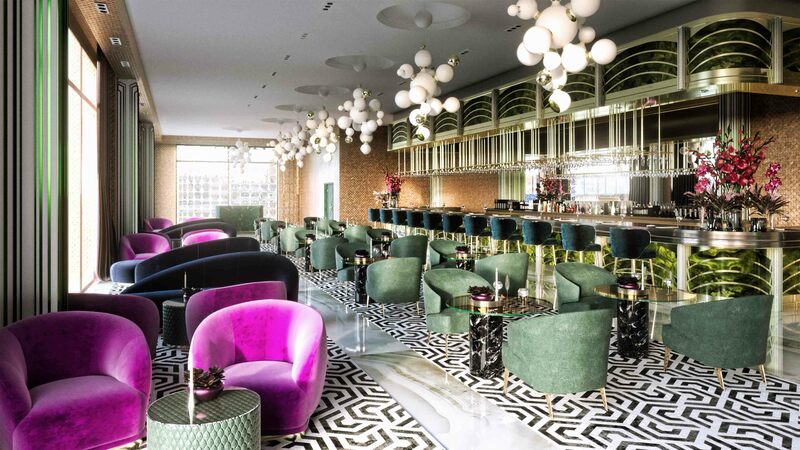 The 14 meter bespoke bar features a brass wine gantry and scallop fret work panels accessorised with teal blue velvet stools. Atom chandeliers hang above the lounge area by Portuguese designer Delightful, brass fret work screens separate the cocktail lounge from the formal dining area. 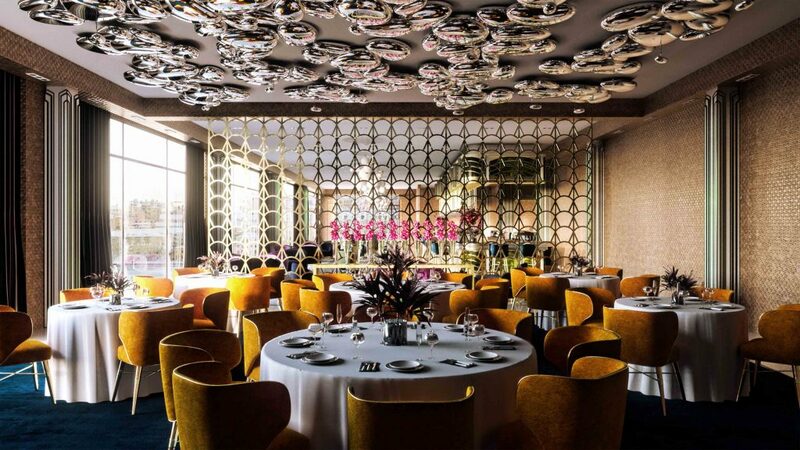 The fine dining room walls are clad in beaten copper panels with space-age pebble lights suspended on the ceiling by Italian designer Artemide. Our interior design brief was to capture the essence of the original Art Deco inspired style of the iconic Harrods food hall whilst creating an elegant, modern and stylish fine dining destination. 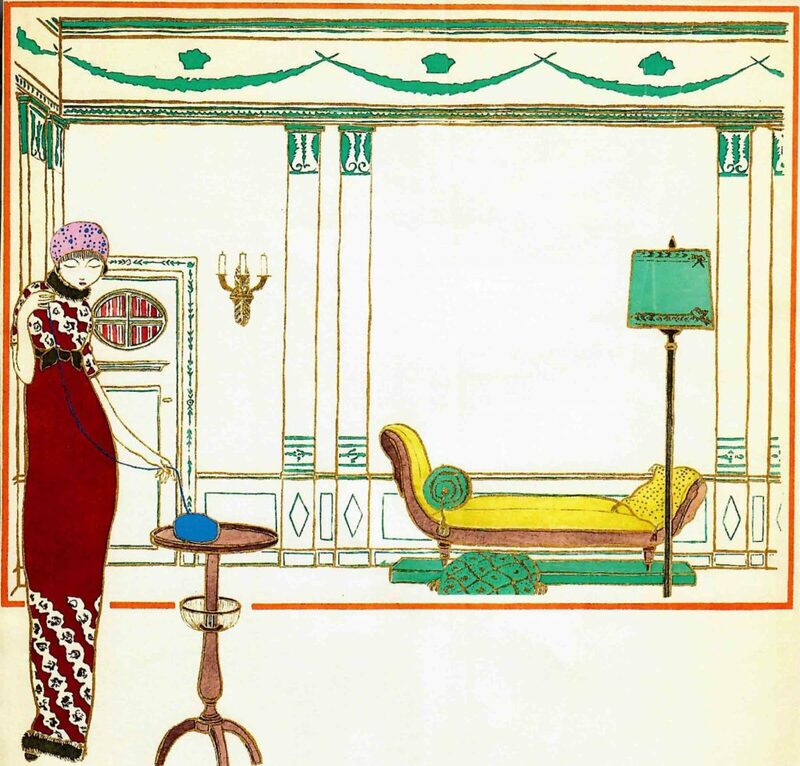 For the interior design, furniture selection and styling we looked at the fashion plates of Couturier Paul Poiret at the turn of the 19th century. The French couturier was the most fashionable dress designer of pre-World War 1 Paris. Poiret was particularly noted for his Neoclassical and Orientalist styles. One of his great achievements was to free the female form from the rigid corseted structure. Inspired by the designers illustrations in the Gazette du Bon Ton (below) we decided to incorporate the opulence of the sketches into the interiors styling. Creating a stylish and feminine design aesthetic with signature touches alluding to Mr Poiret’s orientalist fantasies. Winning the client over with our proposal of Paul Poiret and his orientalist fantasies was the biggest hurdle – eventually a Poiret/orientalist light aesthetic got the client on board. In addition the budget constraints for the project have been challenging as we’re having to maintain design integrity and also manage the clients expectations. Seeing endless discussions and design development finally coming to fruition. Sheridans is going to be unique to the area – there really is nothing quite likes it in Manchester. The SBID award is a fantastic platform for designers to showcase their work to the industry and to other fellow creatives. 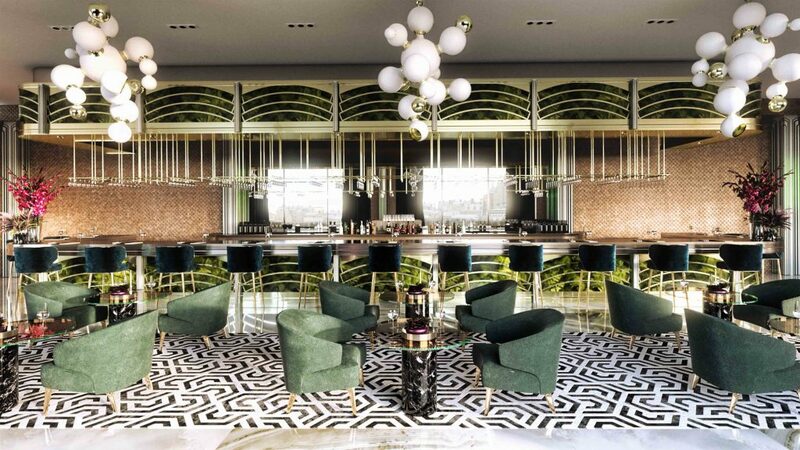 We felt the design and visualisation for Sheridans is a proud moment for us as a design practice, we feel we have designed and cultivated something very unique here and wanted to tap in to our fashion backgrounds in designing and implementing this beautiful scheme. If you missed last week’s Project of the Week featuring aquatically inclined Australian luxury spa inspired by the serene blues and tranquil textures of underwater landscapes, click here to see more. The 2018 edition of the SBID International Design Awards is now officially open for entries! Click here to register or enter your project!